KAMPALA – Phase one of Ruparelia Group’s giant Kingdom Kampala Mall, project will be complete by April this year and ready for occupation, by the beginning of May. We gained access to photos of the building’s uniquely finished interior as well as exterior night photos. Standing majestically tall, the Kampala Kingdom Mall lights up the Kampala sky. The mixed-use building- a blend of light retail as well as 10 floors of office space- offers 22,000m2 of lettable space- 18,000m2 of office space and 4,000m2 of retail as well as parking for up to 450 cars. 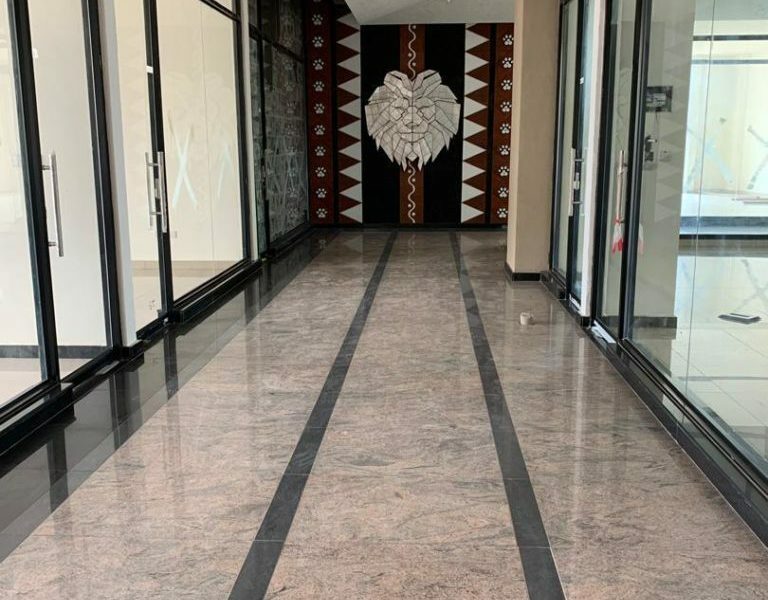 According to Rajiv Ruparelia, the Managing Director of Ruparelia Group, nothing has been left out “for the building not to be called a Grade A building. The main entrance to the building is a delicate combination of steel, marble, glass, lighting and a touch of iron sculpture- giving off a classy finish. The building’s management, Crane Management Services, is giving a 3-months offer of free rent to tenants. The building has 2-floors of retail space, altogether, a total of 47 units, linked by an elevator. The building has been fitted with a modern sprinkler fire suppression system consisting of a 200,000-litre water tank and 2 fire pumps with a back-up generator. There is a separate holding water tank with a capacity of 150,000 litres. The building is also equipped with 6 lifts- four with a capacity of 13 passengers and two with a capacity of 20 passengers. It also has three 500kva backup generators and has been fitted with 400 CCTVs for security. 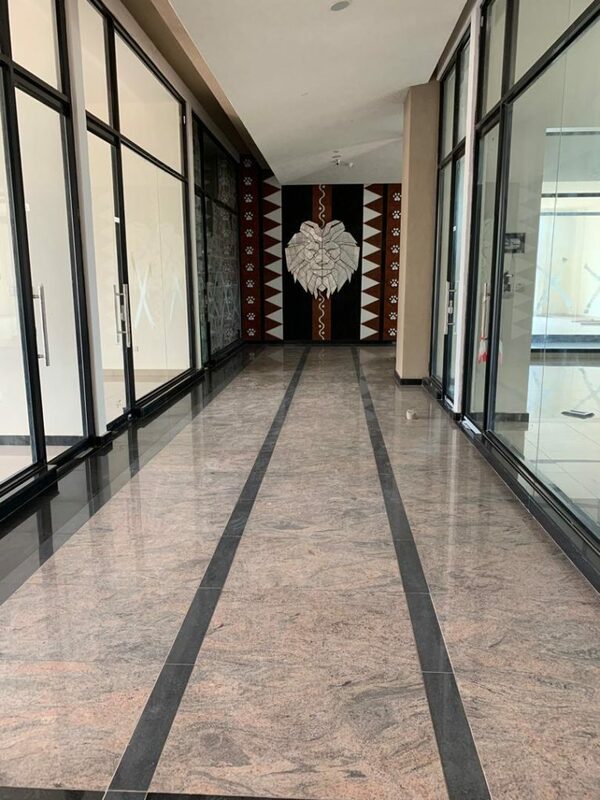 One of the office floors exquisitely finished with high-grade marble and a touch of African-themed iron sculpture. There is 18,000m2 of office space, occupying 10 floors. On average a square metre will be going for $18 plus service fee and VAT for office space, while for retail, rent is customizable on inquiry. Another view of the retail space- with an African finish depicting the King of the Jungle. Meera Investments, the property development arm of the Ruparelia Group, the building’s developers, are the largest developers of commercial and residential space. With over 300 properties in Kampala and other major towns like Mukono, Jinja, Mbale and Mbarara, the company that has the largest number of ongoing real estate projects, is also the largest private owner of commercial land in Kampala.